We already sailed into the second week of November without starting my usual Thankful Thursday posts. As my attempt at garden posts shows, consistent blogging hasn't been my strong suit this year :) Busy household indeed. I've also started a photo editing class which I'm really enjoying but its so fun to just keep tweaking old fav photos, I have had less free time than usual (which even then is in short supply). So I apologize. That said, there is so much to recognize as blessings this year -- even the busyness of our household. Again we've started our Thankful paper chain tradition and my does that chain grow quickly with 5 people adding to it instead of just 3. I think it says something about the impact of sharing your thanks with a group -- it grows! This pic is of our chain near our dinner table is from the end of last week (when I originally intended to post). Items the kids have added to the chain include: Mom and Dad, Grandma and Grandpa, Aunts and Uncles, Friends, Legos, House, Supper/food, school, brothers, plus a few other important people listed by name. Here's some of my recorded thanks this week and last: Beautiful fall weather, Supper with all 5 of us together, Being cooked for, Time to reconnect with friends, MOPS, helpful kids, good reports from teachers of kids doing their best, sunshine coming in the windows, smells of cooking applesauce, safe travel, worshiping with our church family. How do you encourage a spirit of Thankfulness in your home? 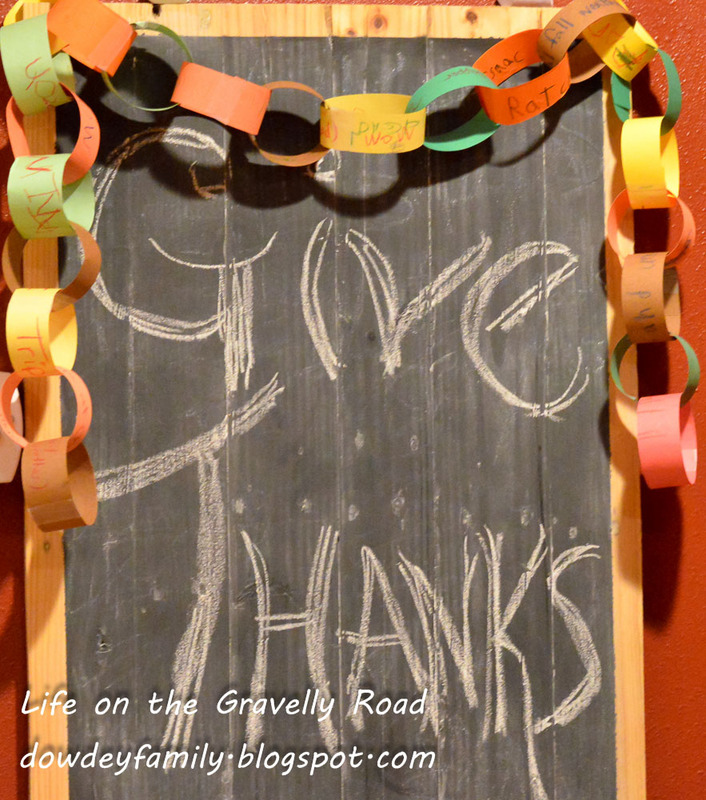 Happy Thankful Thursday from Life on the Gravelly Road.